The ViewSonic VX4380-4K monitor combines the 4K UHD resolution with its massive 42.5-inch viewable screen to deliver an immersive viewing experience no matter whether you’re gaming, watching movies, or just web surfing. The monitor also features an all-around thin bezel which makes the brilliant picture simply pop out. Additionally, it offers plenty of exclusive features for multitasking and gaming activities as well as extensive connectivity options. The ViewSonic VX4380-4K PC monitor features an IPS panel that supports 10-bit color depth through dithering (8-bit + FRC), flawless 178-degree viewing angles, and vibrant colors. Even at 43-inches, the 4K resolution still delivers a sharp and crisp image quality you can enjoy without any scaling necessary. The pixel density amounts to roughly 103 pixels per inch which provide a highly detailed image with consistent and accurate colors at all times. Additionally, the display brings life to games and videos thanks to its superior contrast ratio which allows you to fully immerse into the fictional world. 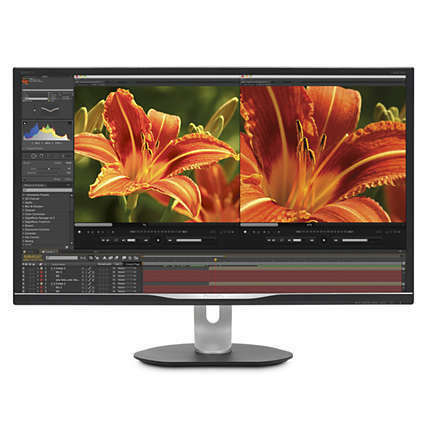 The only downside of the monitor is the rather slow response time that amounts to 12ms gray to gray; You can increase the response time speed in the OSD settings to Advance and Ultra-Fast modes. The former setting reduces the amount of trailing and juddering of the fast moving objects while the Ultra-Fast mode adds a bit of reverse ghosting. For a monitor of such size, the amount of ghosting is negligible and isn’t nearly as bothersome as it can be on most of 40-43 inch VA panels that we’ve encountered. Naturally, you won’t be using the ViewSonic VX4380-4K as a professional gaming monitor due to the obvious reasons such as low refresh rate and lack of adaptive-sync technology, among other things. However, the monitor does offer an amazing gaming experience in more slow-paced video games as the image quality is captivating. You can still play some competitive FPS games on the ViewSonic VX4380-4K monitor and enjoy the experience, to say the least, but players with higher refresh rate monitors and quicker response time will have a significant advantage over you. As the ViewSonic VX4380-4K IPS monitor is more intended for an overall multimedia entertainment rather than competitive gaming, we’ll focus on its unique features. First off, the MultiPicture feature allows you to effortlessly display up to 4 input sources and split the in equally divided windows as four Full HD images. Furthermore, you can use the ViewSplit software once you install it and download for free. This software offers additional layouts for the split screen as well as the optional to customize your own layout. In combination with the spacious and giant screen, these features make multitasking jobs as easy as they can be. The OSD buttons can be used for quick access to change input source, open the MultiPicture feature, and swap though the ViewMode pre-calibrated picture settings. There’s also a joystick next to the buttons, which offers intuitive and effortless navigation through the OSD menu. The ViewMode presets include well-optimized picture settings for different scenarios such as Game, Movie, Web, Text, MAC, Mono, and a Standard user-configurable mode. There are also several gaming-oriented picture presets including three custom profiles, two FPS, RTS, and MOBA modes. Besides utilizing custom parameters of brightness, dynamic contrast ratio, sharpness, and color levels, the gaming modes also incorporate a low input lag mode and the black stabilization for better visibility in the dark scenes. While the low input lag mode doesn’t make the ViewSonic VX4380-4K adequate for the high-end competitive gaming, it reduces it by an expected amount for a 60Hz monitor which is more than enough for casual gaming. Lastly, you can select six different gamma settings, adjust color and saturation, and enable the low blue light filter which along the flicker-free screen allow you to work, play, and watch movies for hours without straining your eyes; the monitor employs the WLED technology as its light source. The design of the ViewSonic VX4380-4K consists of a mesmeric thin-bezel and an overall slim profile while the monitor weights about 25 pounds. 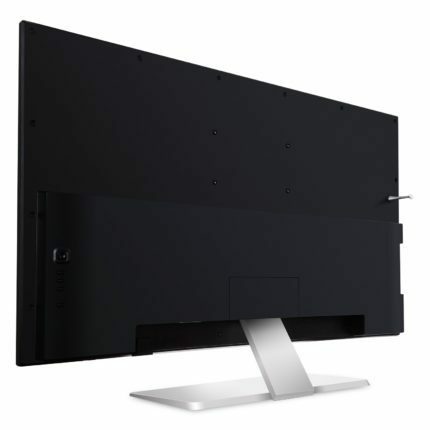 The monitor is tilt-only by -5, 12 degrees, has a steady base and offers 200 x 200mm VESA mount compatibility. The screen of the monitor is coated with an anti-glare matte protection layer. The connectors inputs are as follows: two HDMI 2.0, a DisplayPort 1.2, a miniDisplayPort 1.2, and a DisplayPort-out with MST support for daisy-chaining multiple monitors. There are four USB 3.0 ports and an audio line-out port available as well as the 2x7W built-in speakers which offer complete multimedia experience. 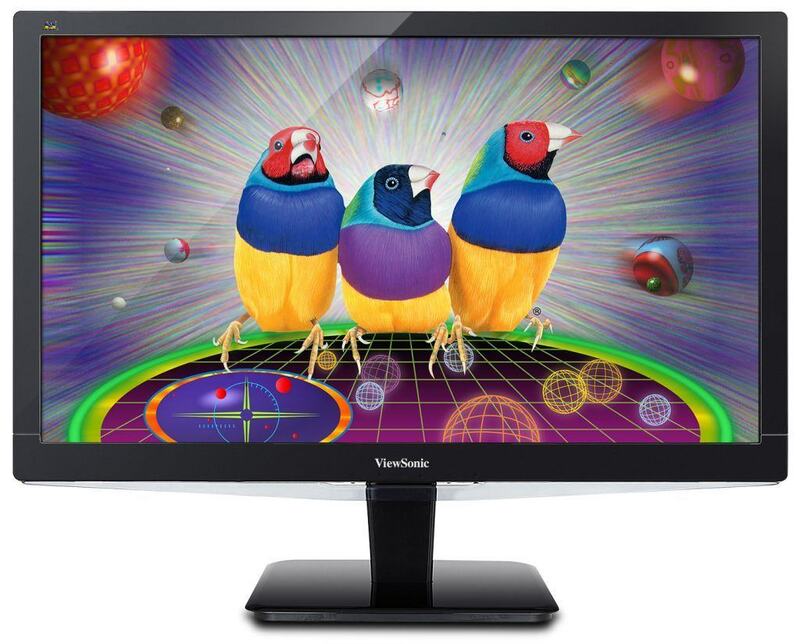 The ViewSonic VX4380-4K price amounts to $800, at the moment (May 2017). For a monitor of such size and screen resolution, it’s a reasonable price. 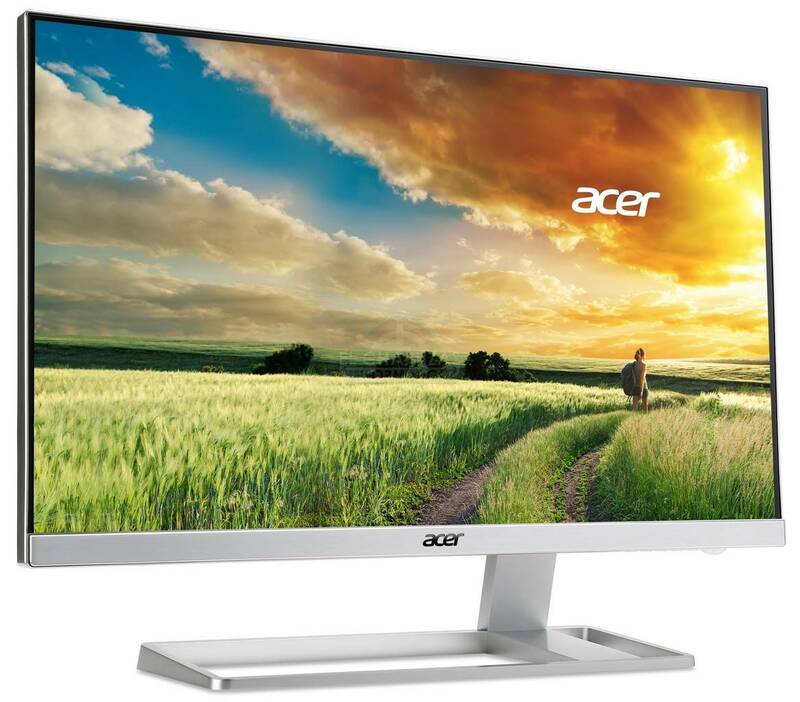 Add to that the plethora of exclusive multitasking and game-enhancing features, extensive connectivity options, and the attractive thin-bezel design, the monitor is an excellent mixture of specifications for its price. The monitor also comes with a three-year warranty. 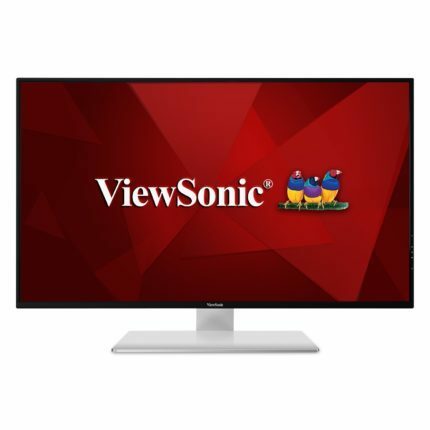 Overall, the ViewSonic VX4380-4K is a reasonably priced 43-inch 4K monitor that delivers exceptional image quality and smooth performance for everyday multimedia use. The monitor does suffer from some visible ghosting in the fast-paced video games but in an expected amount which won’t affect everyday use and even casual gaming. In terms of contrast, color uniformity, and backlight bleeding, the monitor delivers an impressive performance worth its money. If you need (or want) a huge display with a sharp and vibrant image quality at a reasonable price, the ViewSonic VX4380-4K is the way to go. The ViewSonic VX4380-4K is a reasonably priced 43-inch 4K display that delivers a brilliant image quality with high contrast and vibrant colors. Moreover, it features a narrow bezel design with plenty of connectivity options. This monitor has an anti-glare coating but for some users it is reflective. Where is the truth ?